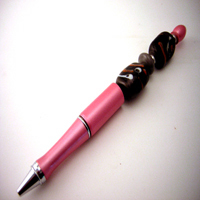 I had a lot of fun making the beads that adorn this pen. With all the typing and work most of us do on computers every day, writing with a pen becomes a special occasion. Make it even more so as you sign your name or write your story with these unique and beautifully made pens.Grey with coral and white accents tell the story! Yes, the pen is pink!